Katharina Unger grew up on a farm and knew exactly where her food was grown. After moving to Hong Kong she asked someone where the abundance of food came from in the middle of the urban setting, and her friends had no idea about the origins of their food. She says that urbanization causes separation between humans and nature, and creates a large divide between the places where we consume food vs the places where food is produced. In her TEDx Talk What if this device could change your eating habits, Unger talks about food production, the future, and her desktop insect farm called LIVIN. LIVIN is currently running a Kickstarter campaign to gain funding for a second insect farming kit. If one third of all the croplands on the planet are used to feed animals, and eighty percent of all antibiotics are used in livestock production. Animal production is a large factor in climate change and creates waste. Unger’s burning question was whether or not she could grow food in her own home, and give others the means to do the same? Her eventual solution came from the insect world – insects are one of the largest biomasses on the planet but most go uncultivated. 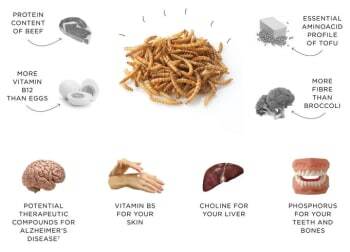 She says that the mealworms she grows combine the protein content of beef with the amino acid profile of tofu, while using ten percent of the land required for beef and only a quarter of the feed. Unger began an experiment to eat insects on a daily basis, and began to grow her own insect food. She talks about designing her insect growth device with the requirement that the feed worms could live full and content lives, with design details tested down to the color of the self-collection system. This talk is excellent in terms of content and Unger explaining the ideas and design constraints used to design her product. Food security remains one of the issues that engineers will need to solve in the mid to late twenty first century. Many of the graphics from the 2015 talk in Vienna were still in place during the first 2017 Kickstarter campaign, but this 2018 education and meal worm growth kit are totally redesigned with an educational spin and Arduino based open source system. The campaign for the Hive Explorer ends on January 11, 2019.